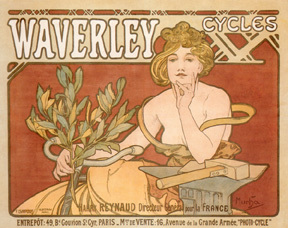 Waverly was an American brand of bicycle, manufactured in Indianapolis, but with representation in the major European countries. It was a sturdy machine, and Mucha did not bother to show it by drawing the cycle itself, but expressed it symbolically by having the resolute young lady leaning on an anvil. She is holding in her hand a branch of laurel leaves, to indicate the prizes won by the bicycle. Mucha's design is almost austere by comparison with some of his other works, but highly effective. There is a saying, "Sell the sizzle, not the steak" and Mucha knew this instinctively.